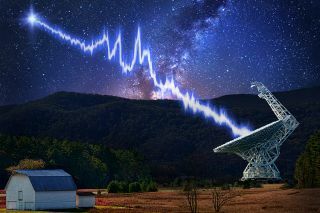 An artist's impression of the Greenbank Telescope in West Virginia receiving signals from fast radio burst FRB 121102. The object was observed by the Breakthrough Listen project. Repeating bursts of radio waves coming from a distant dwarf galaxy probably aren't signals from an extraterrestrial civilization, but that hasn't stopped a group of E.T. hunters from investigating this peculiar phenomenon. In August, scientists with the $100 million Breakthrough Listen initiative began observing an object known as FRB 121102. The object is one of less than 40 known examples of a fast radio burst (FRB), an incredibly bright flash of radio waves. Scientists don't yet know what causes FRBs, which is why they took a particular interest in FRB 121102. While all other observed FRBs are single explosions of radio waves, this one was releasing bright flashes of light over and over again. "As far as the FRB121102 goes, I don't think there is any slight possibility that [the pulses] are from an extraterrestrial intelligence," Vishal Gajjar, a scientist with Breakthrough Listen, said yesterday (Jan. 10) during a news conference at the 231st meeting of the American Astronomical Society in Washington, D.C. The primary reason for Gajjar's skepticism is that the object is in a dwarf galaxy about 3 billion light-years away from Earth. A civilization trying to contact another civilization probably wouldn't bother to create such a powerful signal, simply because the time it would take to receive a reply would be prohibitively long. For example, the radio waves from FRB 121102 took 3 billion years to reach Earth — the civilization that sent the message might very well be dead and gone by the time it received a reply! But Gajjar said Breakthrough Listen is also interested in investigating unexplainable phenomenon in the universe, even if those phenomena are naturally occurring. One explanation for the polarized light coming from FRB 121102 could be the presence of a very strong magnetic field, according to a statement from the University of California, Berkeley, where the Breakthrough Listen laboratory is based. The only known place in the universe with such strong magnetic fields is in the vicinity of a massive black hole — such as the supermassive blackholes thought to lie at the centers of most galaxies — that has gas and dust falling into it, according to the statement. The authors of the paper hypothesize that the source of the radio waves could be another highly magnetized object, known as a magnetar, that lies near a massive black hole. A magnetar is a type of neutron star, an incredibly dense nugget of material about the size of a city, that forms when a massive star runs out of fuel and collapses. If this is, in fact, the source of FRB 121102, Gajjar said that's another reason to suspect that the signal is natural, not artificial: An environment with such an extreme magnetic field wouldn't be very habitable because of the extreme conditions it would create, he told Space.com in an interview. The polarization of light from FRB 121102 was also observed by a group of scientists using the William E. Gordon Telescope at the Arecibo Observatory in Puerto Rico. Breakthrough Listen used the Greenbank Radio Telescope in West Virginia, coupled with a massive computing system that consists of 32 computing nodes, each taking in 1 gigabyte of data per second. In an hour, that adds up to the equivalent of 18,000 DVDs, Gajjar said at the news conference. The huge computing backend allows the researchers to capture a wide range of radio frequencies simultaneously, providing a more complete picture of the irregular pulses coming from FRB 121102. The Breakthrough researchers observed the FRB in some of the higher-frequency radio waves emitted by the FRB, where they found pulses of light that lasted for between 0.00003 and 0.009 seconds in duration. Those incredibly short pulses can be used to indicate the size of the object emitting them, and, according to the paper, the object could be as small as 10 kilometers across, or the typical size of a neutron star, according to the statement. The researchers say they plan to study the repeating FRB in even higher frequencies than what was reported in the paper, which could potentially help them narrow down the possible sources of the burst even further, according to the statement. At the news conference, the paper's authors said there are many other hypotheses that could explain FRBs. It is unclear yet if the peculiar behavior of FRB 121102 is unusual among all FRBs or just among those that scientists have been able to observe, they said, but there are new radio telescopes coming online soon that will be able to scan for these events and help researchers learn more about them. Recently, Breakthrough Listen scientists have also studied the space rock 'Oumuamua that scientists believe came from another solar system, and "Boyajian's Star," which has mystified astronomers with its strange flickering. Editor's note: This article previously stated that the dwarf galaxy is 3 billion miles away from Earth; it is 3 billion light years away.